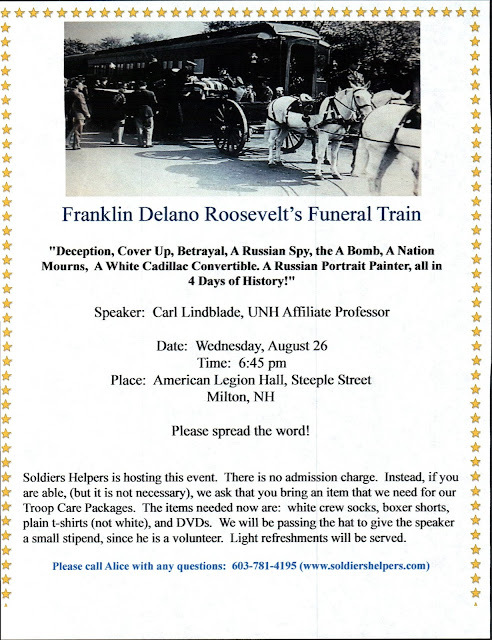 "Franklin Delano Roosevelt's Funeral Train"
Spread the word! Deception, Cover Up Betrayal, A Russian Spy, the A Bomb, A Nation Mourns, A White Cadillac Convertible. A Russian Portrait Painter, all in four days of history! Soldiers Helpers is hosting this event. There is no admission charge. Instead, if able, please consider bringing an item for a Troop Care Package. Items in need are: white crew socks, boxer shorts, plain T-shirts (not white), and DVDs. They will also be passing the hat to give the volunteer speaker a small stipend. Light refreshments will be served. An old newsreel about the funeral. Carl Lindblade speaks about the FDR Funeral Train in this clip from a past talk.